Peace of Mind Built In to Every Home. Heirloom Builders, Inc. is a residential design/build construction company located near Chapel Hill, NC - specializing in green home-building and custom cabinetry. Since 2011, we've been milling our own lumber and building everything from outdoor pavilions, to custom cabinets, to high performance homes. Based in Silk Hope, North Carolina, Heirloom Builders, Inc. is committed to energy efficient and natural building methods. Our strategic objective is to build with locally-sourced material every step of the way. That's why we mill our own lumber. We care about the earth, and the impact that building has on it. Our goal is to build homes that produce their own energy and have a net positive impact on the earth. The modern home is much more than just a shelter. The home is a living system. It can work for us. That's why we use the sun to heat water and energize the home. We believe that rain water is a valuable resource that most homes don't take advantage of. It's easy to collect the rain, filter and store it for domestic uses and irrigation. Combining our proven techniques with modern technology, we build homes that have no utility bills, and provide a place to live freely. We believe it is our job to innovate. To steer the future of green home building back into local economies and further into self-reliance. Home is more than just a shelter. Its a place of refuge, a place to grow, and a place to feel peace of mind. Custom kitchen in Fearrington Village, near Chapel Hill, NC. 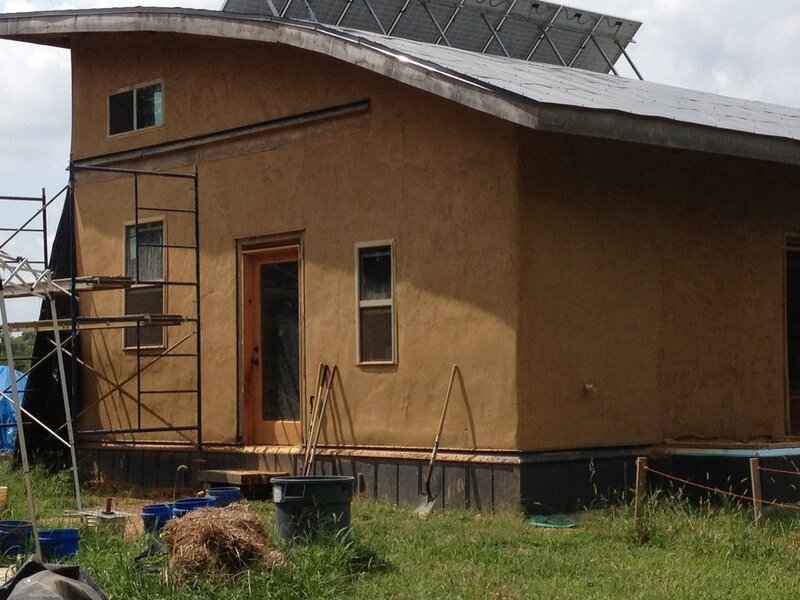 Our Design Headquarters is a natural home built with straw bales and earthen plaster. It offers inspiration in every detail.